Catholic Charities welcomes individuals and families of all faiths or no faith tradition. 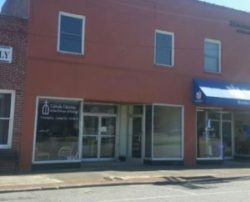 This office located in the town of Hertford serves the following counties: Bertie, Camden, Chowan, Currituck, Dare, Gates, Hertford, Hyde, Martin, Pasquotank, Perquimans, Terrell, Washington. Catholic Charities understands the importance of an individual becoming “whole” both emotionally, spiritually and physically when going through life’s transitions and challenges. Please contact our office if you have questions about community counseling services. We provide healthy foods and nutritional awareness to our communities. Families seeking assistance with food will also be screened for other needs which Catholic Charities can either address, or referred to a community partner. Families are invited to browse our selection of donated clothing items to find what fits their needs. We provide limited emergency financial assistance for utilities (based on availability of funding). Applicants need to call the office to set up an appointment with the Emergency Assistance Application. To find out how you can volunteer, please contact the Hertford Office at 252-426-7717. Food Pantry & Clothing Closet Monday: 9:30 a.m. - 11:30 a.m. Thursday: 9:30 a.m. - 11:30 a.m.
1st and 3rd Friday of every month. 2nd and 4th Friday of every month.